The ancient city of Timbuktu was the main centre for commerce and scholarship in West Africa from the 13th century until the 17th century. Books were bought from North Africa and other centres of Islamic learning, and local scholars also wrote many books on astronomy, medicine, mathematics, literature, law and islam. Scholarship peaked during the 16th and 17th century but declined gradually until the 19th century. 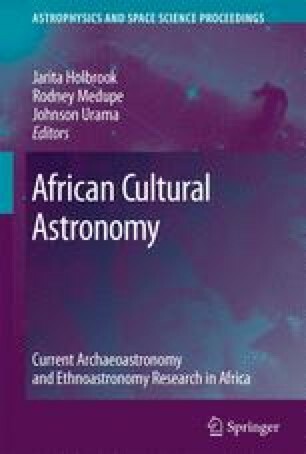 Our project aims to study the ancient manuscripts from Timbuktu in order to search for astronomy in them. The main aim of the project is to document our research and use it to attract African youth into science and technology by appealing to their heritage. This paper outlines progress made since the inception of the project in 2006.